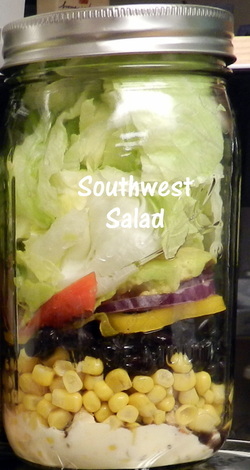 Going To The Southwest In A Jar Ole..
Hello everybody! Sorry I lost you for a few days it has been a chaotic busy week! I am finally getting this recipe up for you..These jars help me tremendously through the week when I am looking for something quick to grab for lunch. If they are not in front of me I have a tendency of grabbing something not quite so healthy. So even though I had a very trying week I was still down 4.4 pounds. Yay me! lol.. So here goes the recipe and remember it’s all about the layering otherwise you wind up with a very soggy salad. Also this will keep for up to 7 days in the fridge, not like you would keep it in there that long..just sayin..I double and triple the recipe so I get a few days out of it. After you have layered all of your ingredients just screw the top on put in your fridge until you are ready to eat. It’s that easy! Watch this coming week as I am going to be doing complete, yes I said complete crockpot meals! Everything in one pot! Meat, potatoes and veggie! I’m on a taste test week..Hubby is going to love it! Until next time remember..It’s so much more then just a jar..Mama Carol..